Want to generate attention in today’s always-on, Web-driven world? The answer isn’t just slapping social media onto dusty old strategies. The rules have changed. In New Marketing Mastery, David Meerman Scott cuts through the confusing new communication landscape and lays out meaningful, measurable and no-cost strategies to instantly reach your audiences directly. This informative, entertaining and high-energy course shows the best examples of success from a wide variety of large and small organizations — from business-to-business outfits to rock bands, nonprofits to entrepreneurial growth businesses. David energizes people to put fear aside and inspires them with confidence to apply new thinking: social media are the tools, but Real-Time is the crucial mindset. With a rebel’s heart, David abandons the controlled and message-driven advertising and PR paradigm. He shows how to win the hearts and minds of your audience using blogs, YouTube, LinkedIn, Twitter, Facebook, Newsjacking, and other new tools to create content that buyers are eager to share. David developed New Marketing Mastery in collaboration with Tony Robbins as a way for participants in Tony's 5-day Business Mastery program to learn after they've heard David's talk at the event. The ideas of New Marketing Mastery have helped thousands of entrepreneurs to grow their business, sometimes by millions of dollars, soon after learning these ideas. Put the ideas of New Marketing Mastery to work for you today. "New Marketing Mastery with David will blow your mind. It will give you that disproportionate advantage that most people don’t have because they’re doing what worked in the past and they’re missing what works today." "One of those select few people who saw and understood the social media phenomenon as it began." "It is the new rules. A whole new world." "David's ideas have allowed our Southern California law firm to expand its sphere of influence from local to global. Our efforts have resulted in expanded audiences and relationships we never before thought was possible. Interviews, commentary, and in the end, new clients and cases are the happy result of our efforts. To make sure you go about it the right way, follow the advice of David Meerman Scott and get ready for the ride of your life!" 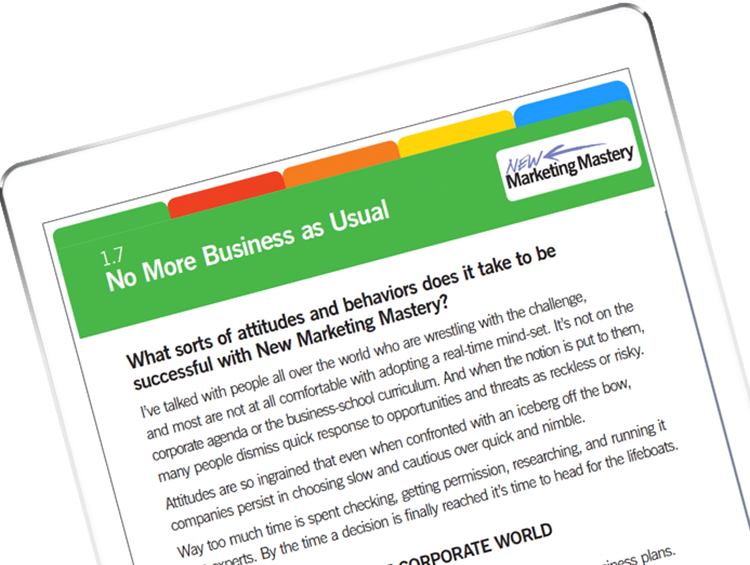 Get started with new marketing mastery now! Download this free infographic to learn how. He’s a sales and marketing strategist who has spoken on all seven continents and in 40 countries to audiences of the most respected firms, organizations and associations. He's a featured speaker at Tony Robbins Business Mastery events and developed the New Marketing Mastery online program with Tony's support especially for Business Mastery participants. David serves as an advisor to select emerging companies who are working to transform their industries by delivering disruptive products and services. He is an advisor to HubSpot (NYSE: HUBS), where he also serves as Marketer in Residence. He began working with HubSpot in 2007 when the company had a handful of customers and fewer than 10 employees, helping the HubSpot team with rapid sales and marketing strategies that have grown the company to 15,000 customers in 90 countries. His current portfolio of advisory clients also includes SlapFive, Mynd, Expertfile, RISEcx, Set The Set, VisibleGains, Foxtrot Systems, and GutCheck as well as non-profits including the Grateful Dead Archive at University of California Santa Cruz and HeadCount. David is author or co-author of ten books - three are international bestsellers. He is best known for The New Rules of Marketing & PR, now in its 5th edition, which has been translated into 26 languages and is a modern business classic with over 350,000 copies sold so far. David also authored Real-Time Marketing & PR, a Wall Street Journal bestseller, and his newest hit now out in a revised paperback edition The New Rules of Sales & Service. He is a co-author of Marketing the Moon (with Rich Jurek) and Marketing Lessons from The Grateful Dead (with HubSpot CEO Brian Halligan). 3.1 Your Buyers are on Social Networks. You Should Be Too. 4.29 Add Value. Don't Sell. 4.32 What's Your Legitimate Tie to the Story? 5.6 Social Media are Just Tools. Real-Time is a Mindset. 5.16 If the CIA Can Operate in Real Time, So Can YOU! 5.20 Now It Is Your Turn! A professional athlete turned marketing strategist thanks to this course! Wow what can I say? I have been a professional athlete for the last 20 years. As an athlete and exercise science student, I have never learned or been knowledgeable in marketing or social media. I never studied any form of business! This course came at a perfect time when I was retiring as a pro athlete but didn't know how to build my business! Thankfully I didn't waste time at an expensive business school, I instead signed up for this course after recommendation from Business Mastery, a Tony Robbins seminar! The change in career from pro athlete to business owner / operator was daunting to say the least. I had no idea how to market our brand or build client base and raging fans! With the help throughout this course, as I went I implemented everything I was learning. I began to use the tools David teaches with my business and creating a social media presence and big fan base using his proven methods. It was absolutely incredible that easy to implement and simple ways to market my business saw a huge growth immediately. My business increased over 3000 percent (yes that is not a typo) in comparison to the previous year. This was all thanks to using the marketing tools I learned during New Marketing Mastery! I have absolutely no hesitation in recommending this to anyone, especially those without business / marketing backgrounds, you won't need one all you need is this! With this revolutionary marketing, anyone can do this, and reap the rewards I did! Thank you David for improving my business and in turn my quality of life. Most Exciting Marketing Adventure Ever! Course was a great extension of David's book and lecture. Loved it and really helped me better understand the new rules of Marketing and PR better than I had before. The videos are short and easy to follow. I'm a visual learner so I really enjoyed the infographics as well. In fact I printed them and have them in an easy reference binder now. I really love David's original idea of News Jacking. We've already used that strategy in our hair restoration practice in Nashville with some success. I highly recommend this course to any person in business for themselves or in a position of influencing people in the organization they work. Nice work David! Hello David, I just wanted to say how fantastic your course is, I am PASSIONATE about HOW we learn, the brain and mind, what you do is amazing, its clever, current, simple, clear, effective, powerful, memorable and that makes LEARNING & GROWTH and EXPANSION easy and FUN, that is what I want to bring to the world, and it has helped me so much :) it really is one of the best training I have EVER DONE, Thank You ! Trina Wright "Coaching Women The Art of Self Promotion"